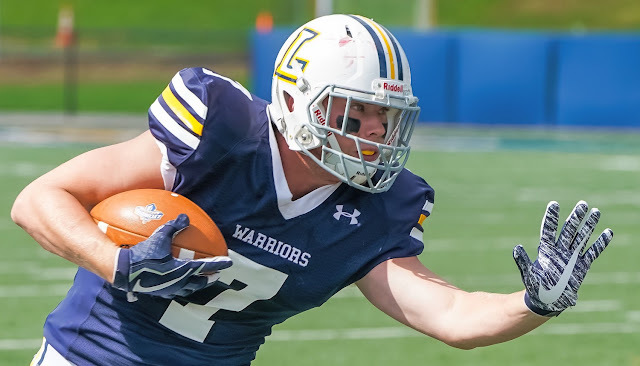 Lycoming Football: This Warrior has been under the radar for most fans, but not for me! Do you see the unsung hero I am writing about? I do! Williamsport, PA - You are very visible if you are a quarterback, wide receiver, or running back, everyone seems to know your name. And even the defense gets visible over the course of the season. Cornerbacks, defensive backs and linebackers get the most visibility. Sometimes defensive lineman can even get noticed real quick, especially if they sack a quarterback. But this guy I am going to write about is quiet, confident, durable and a leader. He is the type of guy who can pick up a team when they are down. He can run, block, catch and tackle. 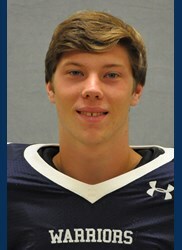 He is senior tight end and special teams player Mike Mulvihill (Tabernacle, N.J./Seneca). I have seen many tight ends over the past 22 years of following Warrior football but have not seen any better. I know, you are thinking, there he goes again, blathering about how great players are now. I do not take my comment lightly and I have data backing up my claim. 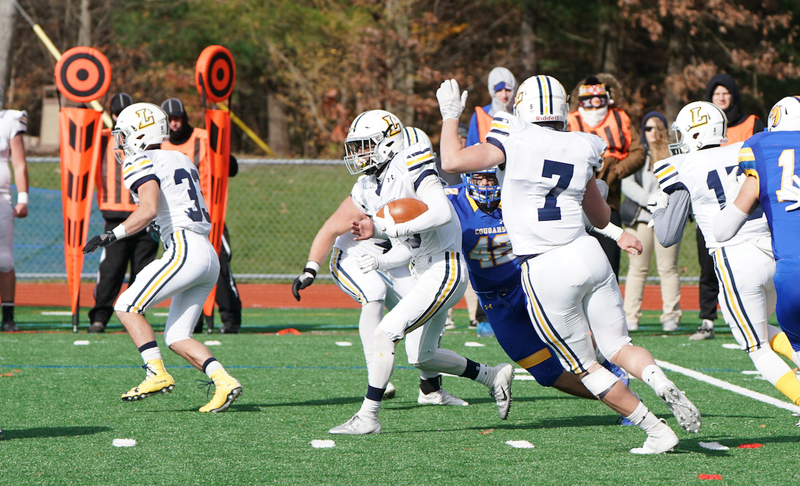 A big hole for the running back set up by Sr TE Mike Mulvihill. Mike Mulvihill is one of the best blockers I have seen in a Warrior uniform. I have many pictures to show it if I wanted to overwhelm this article. If you marvel at how good our running backs have performed, check out where they are running through. It is a big hole between the tackle and the tight end. And that is where Mulvihill is located. Baseball has it's utility players and Mike has been the utility player for the Warriors over the years. He will play wherever they need him. He will play defense, special teams and wide receiver if needed. As a freshman on special teams, Mulvihill returned a blocked extra point for a score. "Whiteman found sophomore Mike Mulvihill (Tabernacle, N.J./Seneca) for a leaping nine-yard score in the right corner of the end zone to bring Lycoming within a point..."
In 2017, Mulvihill started all 10 games as a wide receiver and played on special teams. He caught 15 passes for 138 yards and had at least one reception in the first seven games. Now this is when we had wide receivers like Nick Costello and John Kim in the picture. Mike was seldom the prime target for the Warrior quarterback. With Mike however, there are no complaints, if you throw it to me, I'll do my best to pull the pass in. 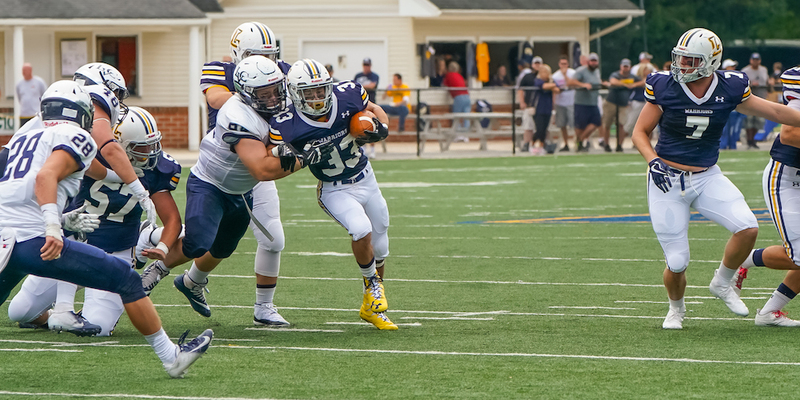 Sr TE Mike Mulvihill has sure hands as seen by this solid catch against Delaware Valley. In 2018, Mike was moved to the tight end position. And it is there that he has found his niche and excelled in the Warrior offense. He had three games with pass receptions over 20 yards; Kings (21), Stevenson (24) and Misericordia (23). At the end of this season, Mike played in all 40 games over four years, a testimony of his desire to play D3 football. It is just hidden sign of his durability and a statement of his talent. That talent did not go unnoticed by the Warrior coaches who saw him as an humble energetic player in his freshman year. 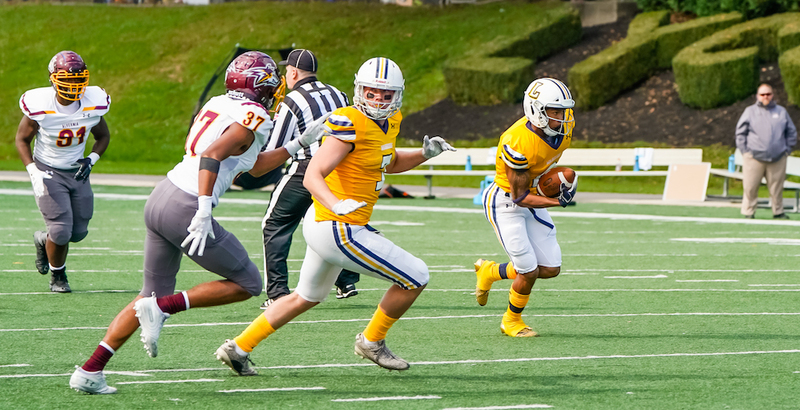 Sr WR Mike Mulvihill, "Your not getting my man!" 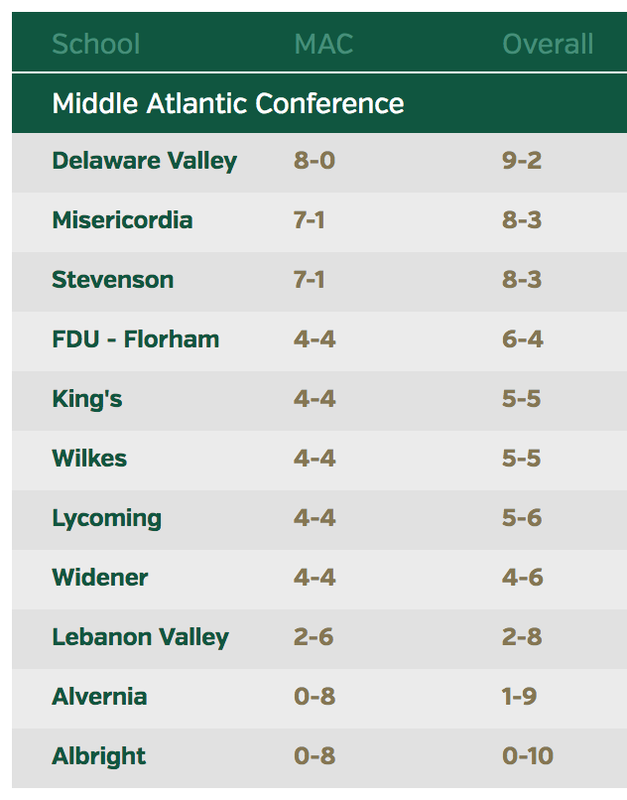 I always hear the coaches broadcast in spring training to the new recruits, if you want to play football for Lycoming, look outside of your speciality. We need special team players, we need you in places you may not have dreamed of. Well Mike Mulvihill heard the call. He will play anywhere. He loves this game and by the way, you cannot find a nicer young man on this Warrior team to boot. Run toward the Mike Mulvihill daylight! #33 Jr RB Keith Batkowski is ready to break loose. But I think the ultimate praise came from one the Lycoming staff members at the Wilkes game. I ask him what he thought of tight end Mike Mulvihill? He said, "He is a leader. He is always lifting up his fellow players, especially when the team is facing adversity." He is a cheerleader on and off the field. 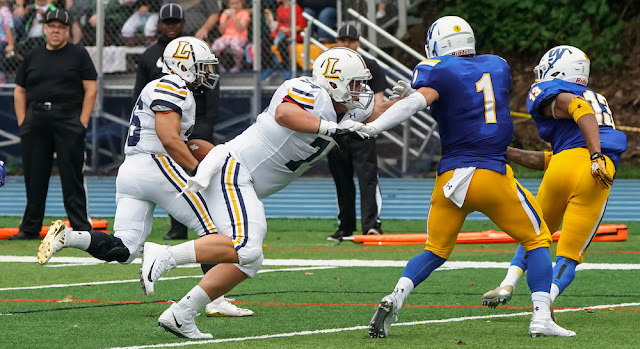 Can Mike Mulvihill block the defense? Oh Yah! So for you, tight end, wide receiver, defensive player, kickoff return specialist, and who knows what else you have done, my hat is off to you tonight. You have made a big impression on your coaches. You have made a big impression on Lycoming fans. You have made a big impression on your coaches. You have made a big impression on your fellow Warriors. You have made an unforgettable impression on me. We know your parents and your two sisters are so very proud of you. Saturday will be your last game of your Warrior football career. When you tie those laces on those cleats, soak up the atmosphere. We you come out of the locker room, look around in the stands. Find your parents who have had so much faith in you and have sacrificed for you. Saturday will be a great day. Enjoy it, win or lose. Because you have played every game possible. Also, because you are a reflection of the best of the Warrior family. You are now part of the Lycoming Legacy! All the best my friend in all you do! Sr TE Mike Mulvihill played in every game over his four year career. Enjoy the Bowl game! Your team has created a solid foundation for the future of Lycoming football.